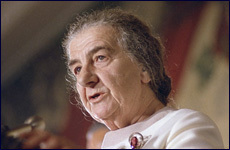 The following op-ed by Golda Meir was printed in The New York Times 42 years ago. To be misquoted is an occupational hazard of political leadership; for this reason I should like to clarify my position in regard to the Palestinian issue. I have been charged with being rigidly insensitive to the question of the Palestinian Arabs. In evidence of this I am supposed to have said, “There are no Palestinians.” My actual words were: “There is no Palestinian people. There are Palestinian refugees.” The distinction is not semantic. My statement was based on a lifetime of debates with Arab nationalists who vehemently excluded a separatist Palestinian Arab nationalism from their formulations. When in 1921 I came to Palestine – until the end of World War I a barren, sparsely inhabited Turkish province – we, the Jewish pioneers, were the avowed Palestinians. So we were named in the world. Arab nationalists, on the other hand, stridently rejected the designation. Arab spokesmen continued to insist that the land we had cherished for centuries was, like Lebanon, merely a fragment of Syria. On the grounds that it dismembered an ideal unitary Arab state, they fought before the Anglo-American Committee of Inquiry and at the United Nations. When the Arab historian Philip K. Hitti informed the Anglo-American Committee of Inquiry that “there is no such thing as Palestine in history,” it was left to David Ben-Gurion to stress the central role of Palestine in Jewish, if not Arab, history. Share the wealth with a friend . . .
← The best way to remember the Holocaust is not with a hashtag!